Let me begin by admitting I am already breaking Sensationalist rules by discussing two games at once, but the visual, mechanical, and thematic similarities between my choices warrant the approach. The two games I am discussing are Ico and Shadow of the Colossus, both developed in Japan by Team Ico. If we want to get psychological with videogame consumption, it would not be a stretch to say the hobby lends itself well to power fantasies. Players are frequently transported into the body of a character with abilities vastly superior to their own. To highlight the player's new found strength, arm muscles will be thicker than thighs. Or just as frequently, players inhabit a lithe and nimble protagonist, able to traverse even the most difficult terrain with a preternatural ease. 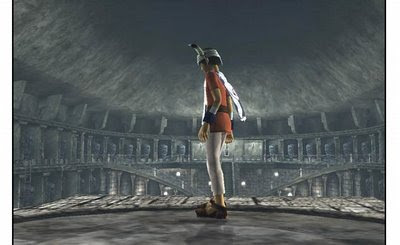 Keeping in mind the tendency towards empowerment, what a brave feat it was for Team Ico to create two games, and two characters, that so successfully evoke a sense of frailty. 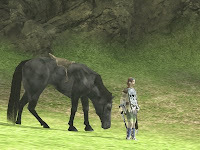 Both the self titled protagonist of Ico and Wander of SotC (so named from the original Japanese title, Wander and the Colossus) appear suddenly in the game environment. Neither character reveals a cat-like prowess or mystical power. Aside from Ico's small set of horns, both are relatively unassuming. Beginning with these small characters alone in an immense landscape, Team Ico depicts an unlikely convergence of strength and fragility. Ico and SotC have been lauded for their stunning visuals and sense of scale. Both worlds are visually enormous, and seamlessly explored by their comparatively small protagonists. Making Ico and Wander seem small is important to creating a sense of frailty. This is partly accomplished with large visuals, but equally important are the sounds. Ico's cries to Yorda echo off massive stone pillars, through wide rooms or vast open spaces. Similarly, Wander's calls to Agro, his steed and loyal friend, stand in contrast to the silence of an open plane or the distant cries of an eagle. Also, each character's call changes depending on the distance to their companion. Where Ico changes his pitch and non-sensical words, Wander pierces the distance with a whistle. Team Ico gives players auditory measurements that remind them of their small and ineffectual stature. If you listen close, the sounds of Ico and Wander betray their frailty. Every high pitched cry Ico gives out when attacking opponents mirrors his youth. Lest we forget, Ico is a scrawny young boy, and with each strike at the shadow beasts making off with Yorda comes the sound of exertion. Ico's panting while running, and each grunt he emits when attacked, is matched by Wander. Just like Ico, Wander will let out a huff when landing after a fall. Wander makes the same sign of labor when riding atop Agro as well. These auditory signals accompany a character who toils through their accomplishments. These are not the sounds of a war hardened champion, but of a fragile character accomplishing strenuous tasks. While playing through Shadow of the Colossus, yet again, I was taken aback by the number of character animations, some of them seemingly unnecessary. When Wander plummets from a cliff side, his limbs flail about, his body contorting to the whims of the player. Occasionally, he will swing his body to the side to move from a ledge above another. Also, his body will correct itself, trying to maintain balance on a moving Colossus or tumble over when thrown from Agro's saddle. Aside from imbuing Wander with a physical form, these animations belong distinctly to a character bound by the fragile human body. Ico's movements betray the same human frailty. When Ico swings at a wall, the force jolts his arm and sends him reeling back. Before dropping off the side of a wall, his arms will windmill about as he desperately tries to maintain balance. Even pulling Yorda along will result in physical tugs. These signs of relative frailty last into the final boss battle. Ico , wielding a sword not of his making, strikes at the dark queen and is knocked prone, unable to hold his grip on the weapon. His valiance is not that of a trained warrior, but an inexperienced child. Setting aside the potential connection between Ico and Wander (Are they the same person? Has Wander found redemption at last? ), both stories end in similar ways and take the same approach to frailty. When Ico defeats the queen, he is knocked unconscious. Shepherded by his previous ward, set adrift on a boat amidst a crumbling castle, Ico is in a complete state of helplessness. Yorda holds him as if a mother to a child, and though Ico has won, his victory is marked not by a new found strength, but a return to sleep. Shadow of the Colossus takes this theme and runs with it. For a brief moment, Wander is given colossal strength but his power is dwindled and he is swept into a vortex. His sleeping beauty, for whom he underwent his trials, finds a baby with horns in his place. Wander is returned to the ultimate form of frailty: an infant. The nameless woman mimics Yorda's actions, and cradles the child like a mother. At last, the player, accustomed to gaining ever amazing abilities as the game progresses, is allowed to rest. Ico and Wander become completely powerless, but their frailty is a reward. These games are not about beefy soldiers overcoming hordes of monsters or ninjas vaulting great heights. Rather, Team Ico weaves these stories about a hidden strength, the strength that reveals itself in times of great need, the strength, courage, and bravery found in even the most humble and frail of protagonists. I won't say anything of Ico, since I'm late to the party on that game and haven't been able to find a decently priced copy. With Wander, however, I don't know if 'frailty' is quite the word for it because anyone who can single-handedly topple a 500 foot colossus is not exactly frail; but you are right that part of what makes him such a relatable character is that he does have real human limitations in this David and Goliath battles. Wander really has to struggle to climb a colossus as he grips at his hair (mirrored by you clutching the R1 button on your game pad). He sometimes stumbles and has to scurry away. And his weapons are a simple sword and bow and arrow. He has no magic spells or super powers. He doesn't even do anything all that special with the weapons he does have. He even starts to look a little beat up and dirty after a few scrapes with the colossi. But Wander's limitations make the game all the more dramatic because it is a story about an ordinary man doing extraordinary things to save the one he loves. The fact that he is underpowered (by videogame standards) as he heads in with his tiny sword and bow to do battle with creatures 30 times his height makes you feel that he would do anything for his one true love, Mono. Add to that the barren landscape that has seemingly been abandoned by all forms of life other than a few lizards and you suddenly get a sense for just how alone Wander must feel while Mono is trapped in an eternal slumber. 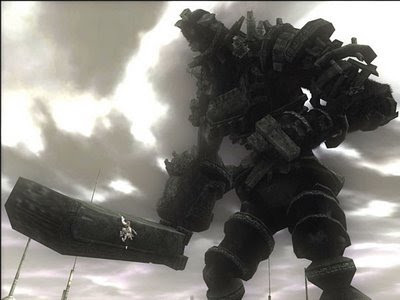 This culminates in one of the greatest love stories ever told in a videogame, and with almost no dialogue, this is a story that is told through good game design, which is what makes Shadow of the Colossus a classic. It was hard to pick just one sensation from SotC because, as you said, the sense of isolation and desperation is equally present. As for "Frailty," the word is difficult because its a relative term. Even a heavy weight champion can be considered weak in comparison to a colossus. So when I use the term frail, I mean both frail relative to both their opponents and the normative protagonist in other games. Their not elderly by any means, but there is nothing to suggest they are anymore powerful than a normal guy off the street with similar body shape. And of course, loneliness is a huge intensifier of frailty. When you’re a tiny guy walking through large fields and mountains without any human contact you start to feel small, crushed and weak. While I've not played either of these (for shame) it certainly is a refreshing change to play a weak protagonist as opposed to a ridiculously mighty hero. Fable 2 sticks out most in my mind as distancing me with this - even as a child you're absurdly powerful and as a result you never really feel challenged or like you're accomplishing anything as it's all so easy. Compare with the development of a character in Fallout or Oblivion, where you start off very weak and appreciate the building of your powers as you go. But on the other hand, there is a certainly delight in playing an unstoppable badass like Marcus Fenix. A quietly controversial post, my friend. Although you bring up a good point about "frailty's" relative meaing, I can't help but share some of JT's sentiments. It's hard to describe just what the Team Ico games convey, but I might choose "vulnerability" or "humanity." Like Danilo said, their protagonists (even if they are powerful) seem to exist as fallible beings, rather than the super soldiers Branch-me-do referenced.